Happy new year! Thinking about new year's resolutions? Pregnancy is a great time to work on making healthy lifestyle changes including healthy eating and a regular exercise routine. Khloe is a good role model because exercise in pregnancy is very beneficial and important for almost all pregnant women! 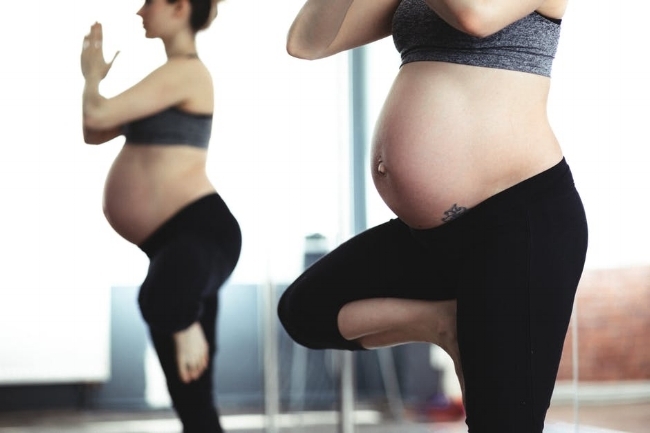 Pregnant women should always confirm the safety of the type and frequency of exercise with their OB/gyn, but for the most part, all pregnant women should be physically active. In general, for an uncomplicated pregnancy in a healthy patient, regular exercise is recommended. The frequency, duration, and intensity of exercise will depend on each woman’s fitness level and exercise routine prior to pregnancy. A good rule of thumb is 20-30 minutes of moderate activity all or almost all days of the week. This recommendation applies to all trimesters. There is not a specific target heart rate or maximum time limit for exercise. Pregnant women typically become fatigued and out of breath quicker than when they are not pregnant so it is normal to have to jog at a slower pace, adjust the amount of weight used, or decrease intensity in general. Pregnant women should be able to maintain a conversation during the workout and moderate intensity is the equivalent of a brisk walk. There are many safe exercises that pregnant women can do. It is important to stay well hydrated, to avoid overheating, and to maintain adequate caloric intake. Pregnancy safe exercises include walking, jogging, swimming, yoga and pilates (with modifications), strength training, aerobics. Swimming or water aerobics are great options for women with back pain or leg swelling. Women should stop exercising and seek advice from their pregnancy provider if they have bleeding, leaking fluid, regular painful contractions, chest pain, difficulty breathing, or dizziness/lightheadedness. Core exercises in hand/knees position rather than full plank. This puts less pressure on your abdominal wall to help decrease the chance of developing diastasis recti (separation of abdominal wall muscles). I hope this helps provide some helpful motivation and reassurance about the importance and safety of exercise during pregnancy. Your body and your future child will benefit immensely! American College of Obstetricians and Gynecologists. Physical activity and exercise during pregnancy and the postpartum period. Committee opinion number 650. December, 2015.